Five Things Friday: Organisation Ideas for the Home | Keeps Me Out Of Mischief! We’ve been waiting to move for ages (despite being promised a quick move by the vendors!) and I’ve been using the time, when I haven’t been packing one of the many boxes, to find some great organisational ideas for our new home. 1. This adaptation to a pan drawer from Houzz means that you don’t have to take all the trays out to find the one you need which is inevitably at the bottom of the pile! 2. Tilly’s Cottage has this idea for under stair storage – this makes the space so much more practical. 3. Tart House shares this idea for using shower hooks to hang bags up, So much better than the pile of bags I have in the bottom of my wardrobe! 4. I love the idea of a menu planner/ list of things we’re out of on blackboards inside the cupboard doors which I spotted on Pinterest. 5. 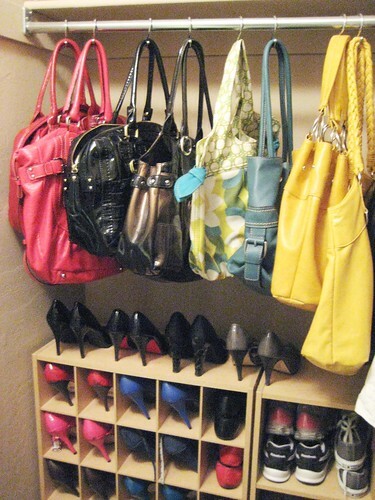 Shoe Daydreams has this idea for shoe heaven – if only!